Join us for a talk by political scientist, Dr. Amita Shastri on her latest publication, Political Parties in Sri Lanka: Change and Continuity (Oxford University Press-India, 2018). Political Parties in Sri Lanka analyses the changing role and impact of political parties in contemporary Sri Lanka. It examines their functioning in a context of severe ethnic conflict, transformations of the political structure, changes in the electoral system, rapid social change, and globalization. It also covers the crucial presidential and parliamentary elections of 2015 and reflects on the experience of individual political parties. Amita Shastri is Professor of the Department of Political Science. She is a comparativist with research and teaching interests in democracy and democratization, ethnicity and nationalism, and political economy of development; especially with reference to South Asia and Sri Lanka. She earned her doctorate in Politics (International Studies) from Jawaharlal Nehru University, New Delhi (1985). She was awarded the Pew Faculty Fellowship in International Affairs, John F. Kennedy School of Government, Harvard University, 1990-91; and has been Research Fellow and Visiting Scholar at California Institute of Technology, University of California at Los Angeles, and University of California at Berkeley . She was a Visiting Fellow at the International Center for Ethnic Studies, Colombo ( Sri Lanka ) in 1991 and 1998, and held the University Grants Commission Research Fellowship in India, 1977-1981. She is the editor (along with Jayadeva Uyangoda) of the recently published Political Parties in Sri Lanka: Change and Continuity (Oxford University Press-India, 2018). Her earlier publications included an edited volume (with A. Jeyaratnam Wilson) titled, The Post-Colonial States of South Asia: Democracy, Identity, Development and Security, (Curzon, 2001) and numerous research articles and book chapters. 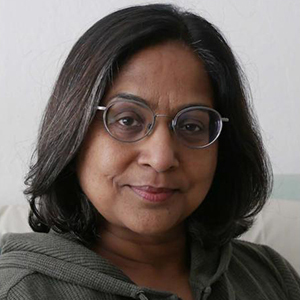 Her articles include "Ending Ethnic Civil War: The Peace Process in Sri Lanka," Commonwealth and Comparative Politics (2009); "Channelling Ethnicity: Impact of Electoral Reform in Sri Lanka," Commonwealth and Comparative Politics (2005); "The Economy in Conditions of Intense Civil War: Sri Lanka 1994-2000," in Economy, Culture, and Civil War in Sri Lanka, edited by D. Winslow and M. Woost (Indiana University Press, 2004); and "Reproducing Hegemony: The United National Party of Sri Lanka," in Political Parties in South Asia, edited by S. K. Mitra et al (Praeger, 2004).